At HART: Glynis provides hands-on oversight of the daily care and health of all the horses. She is responsible for communicating with the current boarders, staff and health care providers to ensure the facility has everything necessary to keep humans and horses happy and healthy. Off the Clock: Glynis and her family are Connecticut natives. She is mom to 3 beautiful kids, dogs, cats and of course horses. She found HART shortly after moving to Florida. In keeping with her line of work she began volunteering and teaching with us during the fall of 2013. Background: Glynis started riding when she was 9. By the time she was 11 she was working at a dressage barn in Willington, CT and riding as often as she could. 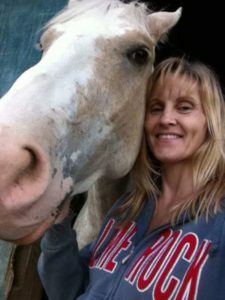 In 2006 she started working at Time Out Foundation in Lakeville, CT. taking care of their horses and leading their Equine Assisted Alternative Therapy Program for At Risk Youth. In 2007 she acquired her Therapeutic Riding Instructor status with PATH Intl. In 2013 she found us and started volunteering and teaching beginner lessons. In 2014 she became our barn manager.